We have recently discovered that, unless changed by you, using the default password for your camera could subject your camera to hacking threats. This could permit a third party to gain unwanted access to your camera’s video feed over the Internet. To prevent this unwanted access, you must change your camera’s default password. To make sure our wireless cameras are as safe and secure as possible, Linksys has been working with law enforcement, including the New York Attorney General’s office, to address this issue. As part of this process, we have developed a firmware update for our WVC80N cameras to help you implement a change to the default password and further safeguard your camera. IMPORTANT: Make sure to download and update the cameras’ firmware before proceeding to the steps below. To learn how to do this, click here. 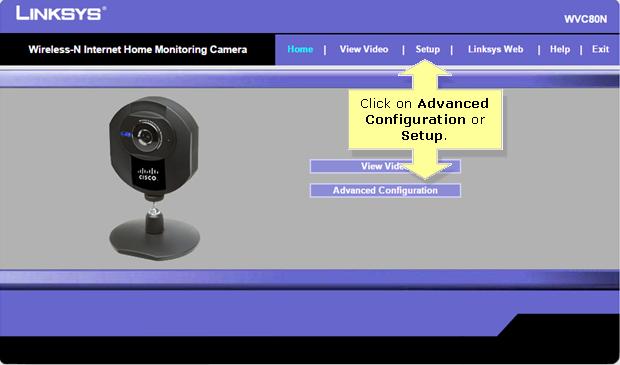 Access the video camera’s web-based setup page and either click on Advanced Configuration or Setup. NOTE: For instructions on how to access the camera’s web-based setup page click here for Windows or if you are using a Mac® computer, click here. Under Setup, select Administration and enter your new password that you want to use in the Password and Verify Password fields and click Apply. Please use caution in setting passwords for your camera. We recommend that you change your passwords often and use a combination of upper-case and lower-case letters and numbers when creating passwords. Always make sure your router has a strong password as part of your home network for added security. You have now successfully changed the login password of your Linksys Wireless-N Internet Home Monitoring Camera, WVC80N!